Wine merchant. Dawson and his wife Octavia (?c. 1832-24 May 1852, Durban) emigrated to Natal on the Dreadnought. There are many unanswered questions about this family. To begin with, it is uncertain as to what their surname was — Dawson or Francis. In the burial register of St Paul’s there is an entry for their son Frederick, dated Mar 1850. The child was buried under the name Dawson, but an asterisk has been put next to the surname and the annotation ‘Francis not Dawson’ has been added, and signed by Revd W.H.C. Lloyd. The other entries in the St Paul’s registers (Apr 1851, Jan 1852 and May 1852) all give the surname Francis. Despite this, Dawson went by the name Dawson in Durban society. The only inkling of anything different comes in a letter from Thomas Roberts, J.C. Byrne’s confidential clerk, to the Government in Nov 1850, in which he refers to ‘Mr Dawson alias Francis’ (Spencer 1989:93 ff). When I read this a few years ago, I wondered if it was the same person who had married Agnes Green in Australia. It now seems probable that it is, and we can construct an outline of the life of Alfred John Francis, alias Alfred Dawson Francis, alias Alfred Francis Dawson. Alfred John Francis was born in or near Liverpool, Lancashire, England, about 1820, and his father was John Francis. In 1842 he married Christiana Fox Dean, and their first son, Dean Francis, was born in 1843. Another son, whos name may have been Alfred, was born about 1844, but this is uncertain. A third son, Frederick Thomas Francis, was born in 1846, again, in or near Liverpool. Then in 1847 Christiana Fox Francis died. Two years later, in about July 1849, Alfred John Francis remarried, to Octavia Cecilia Waring, also in Liverpool, and the following month they seem to have boarded the Dreadnought, sailing from London for Durban. The Dreadnought was an emigrant ship, carrying Byrne settlers to Natal, but Alfred and Octavia Francis travelled cabin class, which means that they must have paid for their passage, and not been part of the Byrne settlers party. They also travelled under the name of Mr & Mrs Dawson, and on arrival in Natal were known by the name Dawson, though, as Shelagh Spencer notes, some knew their real name. The children do not appear to have travelled with them, and Shelagh Spencer notes that two Masters Francis arrived on the Hannah from Cape Town in February 1850. These could have been Dean Francis, then aged 7, and Frederick Thomas, then aged about 4. The third child may have been the mysterious Alfred, who would then have been aged about 6. The question arises, then, why these children did not travel with their father and stepmother, and where they stayed in the mean time. Who looked after three children under 10 on the voyage? Did they stay in Liverpool and leave later? Did they travel to Cape Town and stay there for a while? If so, with whom? Were Alfred and his new young bride wanting to enjoy a honeymoon voyage without the kids? The youngest child, Frederick Thomas, died in May 1850. Octavia then gave birth to Fairfax George Francis in December 1850, but he died just over a year later. Dawson/Francis was cited in a divorce case by John Ross Melcolm Watson, who said his wife had committed adultery with Alfred Dawson of Pinetown. The Watsons had arrived in Durban on the Hannah, the ship that has brought the Francis children. According to Shelagh Spencer, Alfred Dawson/Francis had several other extramarital affairs, and may have left some illegitimate children when he left Natal. Mrs Watson, however, was more than a match for him. After Alfred Dawson/Francis had left Natal J.R.M. Watson went into business with my great great grandfather Richard Vause at Tugela Drift, which they named Colenso after the Bishop of Natal. The Watsons later moved to Ladysmith, and Mrs Watson also had an affair with Isaiah Solomon before eloping with Herbert Stanbridge from Ladysmith in April 1860, accompanied by her daughter Theresa who eloped with Frederick William Beningfield. Dawson was still in Natal early in July 1852. There is no sign of his departure from the Colony unless he was the Mrs Francis who with two children left in Aug 1852. They sailed for Algoa Bay in the steamer Sir Robert Peel. Alfred John Francis then went to Australia, and on 9 January 1858 he was married to Margaret Agnes Anne Wilson, a widow, according to the rites of the Episcopalian Church, at Gundary in the district of Broulee, New South Wales. He is described as a farmer, and one of the witnesses to the marriage was his eldest son from his first marriage, Dean Francis, who would then have been about 14. Alfred is recorded in the marriage register as Alfred John Dawson Francis. He was later a miner and storekeeper, and went insolvent in 1860. Four children were born to the marriage, though there is some doubt about the last, Louisa Francis, as she was born after her father’s death, and possibly conceived in his absence. Alfred John Dawson Francis left his wife in the Bodalla district (on the south coast of New South Wales) and went to Sydney where he lived for four months before committing suicide by taking cyanide on 8 March 1864. He is buried in the Camperdown Cemetery, New South Wales. One of their sons, Arthur Walpole Francis, went to Johannesburg, and after the First World War farmed at Mariental in what is now Namibia. Their descendants went to East Africa, Germany, South Africa and Canada, and possibly several other parts of the world as well. Their daughter Edith married William Throsby Bridges, a soldier, who founded the Duntroon Military College near Canberra in the Australian Capital Territory (and where his mother-in-law had been a teacher many years before). Their descendants live in Australia, South Africa and the UK. Louisa, the youngest, whose parentage is in some doubt, has descendants in Australia, among them Bob Cowley, who has done much research on the Australian side of the family history, and to whom I am indebted for much of the information in this and other posts on this family. Dreadnought, with the children following later in the Hannah. 2. M  FRANCIS, Alfred, born ??? 1844, died ??? 1. Why they travelled to Durban under the name Dawson. 3. Who looked after the children (all under 10) on the voyage to Durban. Spencer, Shelagh O’Byrne. 1989. British settlers in Natal, 1824-1857: a biographical register . Vol 5. Pietermaritzburg: University of Natal Press. Margaret Agnes Ann Green (known as Agnes) would have been about 11 when her father was transferred to the Cape Colony from Canada. She was born in Nova Scotia, where her father, William Green, was in the commissariat department of the British Army, and her mother, Margaret Gray, died when she was about 9 or 10. Several of her brothers went on to make names for themselves in southern Africa, but she soon left for New South Wales. She married William Wilson, presumably at the Cape, when she was about 15 or 16, and went with him to Australia in about 1853 on the Countess of Yarborough. Their first child was born at Sydney early in 1854. They moved to Moruya, about 300 km south of Sydney, soon afterwards, and her husband was storekeeper on the Kiora Estate. He was drowned in the Tuross River in April 1856, leaving her a widow at the age of 20 with two young children, one aged 2 years and the other 8 months. In 1858, at the age of 22, she married again to Alfred Dawson Francis. Between them they had four children, and went on to have another four, and continued to live at Moruya. Francis committed suicide in 1864. Agnes was then 28 years old, and had four young children, ranging in age from almost 10 to 18 months, and was pregnant with a fifth (her second child had died five years previously). There was not much chance of opening a school at Moruya, so she moved inland to Queanbeyan, New South Wales, and opened a school there, which later became the Queanbeyan public school. Perhaps it was because it would have been impractical for her to run a school and look after a toddler that she left the youngest, Edith Lilian, with the McLeod family of Bateman’s Bay (also on the south coast, just north of Moruya). Her assistant teacher was a Miss Goote, who later married her brother Alfred. The new school was recognised as a National School in August 1864, but met with some opposition from local clergy, especially the Anglicans and Presbyterians. who preferred denominational schools. This, coupled with the fact that the school was just across the road from the Methodist Church, may be why she was a Methodist in later years. There were several incidents of harassment, with people prowling in the garden and windows being broken. When the new baby arrived, she found it difficult to make ends meet, and Captain E.M. Battye, a former military officer turned policeman, persuaded her to leave the youngest child, Louisa, with them. Captain Battye had been stationed in Nova Scotia, and so knew Agnes Francis’s family, and no doubt knew her as she was growing up there (letter from Caroline Brathwaite to her niece Katie Pollock, see Cowley 1996:198). Caroline claimed that Captain Battye was with her grandfather (William Goodall Green) at the Cape Colony, but the dates make this seem unlikely, and it is more likely that they knew each other in Nova Scotia, since the Battyes went to New South Wales in 1847, about the time that the Greens went to the Cape. It is possible too that Captain Battye was the natural father of Louisa, since Alfred Dawson Francis died 8 months before she was born, and had been living away from the family, in Sydney, for four months before his death. Agnes Francis sent in her resignation in June 1865, barely a year after starting the school, and after an unsuccessful attempt to take private pupils moved to Sydney, probably before the end of 1865. The family had not been in Sydney long when her eldest daughter, Caroline Wilson, was sent to stay with her brother Edward Lister Green in New Zealand. In 1871 Agnes married Walter William McLean Thwaites in Sydney, and had four more children by him. She married him again in Adelaide in 1879, after the birth of their children (his first wife was still alive at the time of their first marriage – see Cowley 1996:82). In 1887 she was back at Queanbeyan, trying to open another school. According to Bruce McLeod, a relation said she remarried “Napoleon Wilson in 1869, possibly a member of her family”). According to her death certificate, she was born in Nova Scotia, North America, and she had lived 3 years in South Australia, 4 years in Victoria, and 20 years in N.S. Wales. Her first marriage took place in Cape Town, South Africa, when she was 15 years old. Her three years in South Australia were possibly at the time of her second marriage to Thwaites, though they do not seem to have stayed together long after that. She was the “Arthur Francis’s mother” who had a letter from “Judge Wiekalet” (probably Gustavus Wicksteed, who married her mother’s sister). This letter, of which handwritten copies circulated among the family in South Africa, contributed to the legend of royal descent. Margaret A.A. Green also received a monthly pension from the Bank of Montreal, of which her grandfather John Gray was founder and first president. She seems to have had a pretty tough life, and none of her three husbands seem to have been much of a support to her. There is more about her on our Family Wiki site. Much of the research on her life was done by Bob Cowley of New South Wales, who wrote a comprehensive (though unpublished) history of the Cowley, Green and related families of Australia. Agnes Green’s son-in-law was Sir William Throsby Bridges, who founded the Australian military college at Duntroon, near where she had opened her pioneer school. 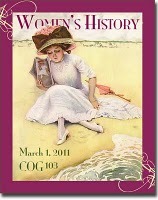 This post is part of a Carnival of Genealogy on Women’s History. Click the link to read some of the other posts. Every little bit helps, and that’s quite a few bits. At least it gives the name of a ship to look for. Though it may not be the one she went from the Cape Colony on, but perhaps the Countess of Harborough only took her to Adelaide from Sydney. In looking for that, I found a reference to Alfred John Dawson Francis (her second husband) going insolvent in 1860 in an NSW archives index. He was described as a miner and storeman at Dwyer’s Creek. But the only Dwyer’s Creek I could find was in South Western Victoria, and presumably quite a long way from Moruya. Just click on the COMMENTS at the bottom of this posting. A fat book arrived from Bob Cowley in Australia today — “Addendum 1” to his Soldiers, surveyors and selectors, which he compiled about 10 years ago, to which this was an update. Quite a lot of it deals with Margaret Agnes Anne Green, and he’s managed to collect a fair bit more on her brother Alfred, who also went to Australia, and on Alfred’s wife Henrietta Goote, including the rather interesting information that she was born in Smyrna, Turkey. He also has death dates for many of Alfred and Henrietta’s children. Included in the package was a copy of the Canberra Historical Journal for September 2005, which has an article by Bob Cowley himself on Margaret Agnes Anne Green, concentrating on her role as a pioneer educationist in Queanbeyan, “The Queanbeyan teacher who was unlucky in love”. And so she was. Her first husband, William Wilson, drowned in the Tuross River. She next married Alfred John Dawson Francis, who committed suicide. Her third marriage, to Walter William Thwaites, was bigamous, so she married him again a few years later. Bob Cowley has a theory that Alfred John Dawson Francis was not actually the father of their fourth child, Louisa Francis. She was born eight months after his suicide in Sydney, and for the preceding four months he had lived apart from his family in Moruya. Louisa was adopted at the age of 18 months by Captain E.M. Battye, who had known the Green family in the Cape Colony and Canada, and Bob is investigating to see whether he could have been Louisa’s real father. In the mean time I’ve been trying to find a record of her marriage to William Wilson in the Cape. No luck so far, at least not in Grahamstown Cathedral in the 1850s, where her brothers Edward and Arthur Green were married. Perhaps she eloped, and married under a different name.